Kyle Cooper was the wunderkind of contemporary film title designers, often described as the new Saul Bass and acclaimed for a body of work that included The Island of Dr Moreau, Donnie Brasco, and the legendarily caustic psycho-opener for Seven, made while he was at R/Greenberg Associates (R/GA) in LA. Then in 2003 he left the much-celebrated Imaginary Forces. Now Cooper has a new company, Prologue Films, and once again his work is appearing on screens around the world. This transition completes an arc begun with his arrival in Los Angeles in late 1993. Sent by Bob and Richard Greenberg with the mission of establishing a beachhead for their NY-based design studio, Cooper directed some 40 title projects at R/GA, and another 46 titles during his six years as partner at Imaginary Forces. In so doing, Cooper has shown that film-making is not a dead end for graphic design, quite the opposite: the power of graphic design remains a force largely untapped by film-makers. It is a paradox that despite the explosion of digital-enabled film-making, the proliferation of motion design curricula, the ramping up of animation and post-production houses worldwide, and the greasing of production pipelines, so many films remain design impoverished. Still, few individuals have shown with such conviction that type, composition, editing, and sound can change everything about the start and end of a film and, when permitted, what happens in-between. Starting over was an act of faith, ‘Out on my own, I wasn’t sure if anyone in Hollywood wanted to work with me,’ he says, but it was also a personal resolution to ‘get back to putting the work first, always, creatively and holistically.’ In a subtle act of upstaging his former company, Cooper revisited the first scene of Henry V, from which he took the name Imaginary Forces, before christening his new venture Prologue Films. This word choice, prologue, makes clear his directorial sensibility: more than a film title, this work is about the first scene of a film. And as such, there is always a degree of risk getting a story started – especially when the story is not your own, belonging as it can to a director such as Mike Newell, or Terrence Malick, or David Fincher. Evoking Psalm 27 as self-evident truth, he quotes, ‘As iron sharpens iron, so one man sharpens another’ to explain Prologue’s growth to a 30-strong cadre of creatives, including Danny Yount, Heebok Lee, and Kimberly Cooper, his wife. ‘Were it not for her Prologue would still be in my garage!’ he says. The company’s worklist in both ads and movies has expanded to include everything from indie romantic comedies such as Wimbledon to monster mayhem like Godzilla: Final Wars, to comic book blockbusters such as Superman Returns and the Spider-Man sequels. 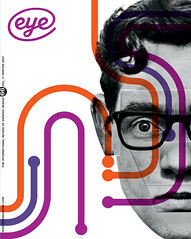 To talk with Cooper is to plunge into a river of design ideas swirling with eddies of feeling and intuition. In illustrating a point about simultaneity and emotional impressionism – by recalling a recent short but raucous trip to India – he paints a (self-)portrait of a hyper-modern traveller enveloped in visual sensations and details that are synthesised without logic or progression. One realises that years of assiduously making film sequences have altered him, changed his nervous system in some way, making him intensely aware of how his body reacts to sound or processes images from his memory and surroundings. In a moment of typical candour, Cooper admits ‘I am not afraid any more.’ Although, he confides, at some level there is still this young person inside, controlling his pencil, processing emotions through his design work. Any deep anger or anxiety about what others may think has been displaced. Where once he rummaged through footage abandoned on the cutting room floor, hoping to salvage a shot, today he can shoot and ‘know I got that shot, exactly as I set it up it in my head.’ Twenty years in, Cooper has aplomb, and the history of film design may never be the same.